Mathematical structures and modeling. - Omsk : OmSU, 2017. №3(43), 172 p.
The formula for the “gravitational” force in a constant static spherical-symmetric space-time, allowing to describe the change of gravity to antigravity, is given. Possible sources of antigravitation are analyzed. The center series of the group of unitriangular automorphisms of a free Leibniz algebra over an arbitrary field is described. Keywords: Leibniz algebra, unitriangular automorphism, hypercenter. At the beginning of the article the authors show unusual and still unknown property of vectors by a concrete example in the 3–dimensional space. The concept of ”conical basis” is introduced upon which new properties of vector space are proved for vector spaces of any finite dimension. It is well known that our Universe is expanding. In principle, we can estimate the expansion speed either directly, by observing the current state of the Universe, or indirectly, by analyzing the cosmic background radiation. Surprisingly, these two estimates lead to somewhat different expansion speeds. This discrepancy is an important challenge for cosmologists. Another challenge comes from recent experiments that show that, contrary to the original idea that dark matter and regular (baryonic) matter practically do not interact, dark matter actually "shadows" the normal matter. In this paper, we show that this "dark matter confinement" can explain the discrepancy between different estimates of the Universe's expansion speed. It also explains the observed ratio of dark matter to regular matter. It is known that in the usual 3-D space, the Schroedinger equation can be derived from scale-invariance. In view of the fact that, according to modern physics, the actual dimension of proper space may be different from 3, it is desirable to analyze what happens in other spatial dimensions \(D\). It turns out that while for \(D\ge 3\) we still get only the Schroedinger's equation, for \(D=2\), we also get the Gross-Pitaevskii version of a nonlinear Schroedinger equation that describes a quantum system of identical bosons, and for \(D=1\), we also get a new nonlinear version of the Schroedinger equation. Linear interpolation is the computationally simplest of all possible interpolation techniques. Interestingly, it works reasonably well in many practical situations, even in situations when the corresponding computational models are rather complex. In this paper, we explain this empirical fact by showing that linear interpolation is the only interpolation procedure that satisfies several reasonable properties such as consistency and scale-invariance. In this paper, we present methods for designing wireless sensor networks with the use of models of the regular circular coverage. The problem dealt with in this work is building the most efficient sensor network at a given complexity of its structure. When solving this problem, the cost of a typical sensor and expenses to run the sensor network are taken into account. The size of the effective area of sensors corresponds to radii of circles. Complexity of the structure of a sensor network is defined by the number of different sizes of circles (one, two or more types) and by a method of positioning the circles. Accordingly, principles of classification of the regular coverage are offered which are based on a notion of the minimum fragment. Methods of calculating optimum number of sensors for bounded regions at a given structure of the regular sensor network are presented. Keywords: sensor networks, circular models of coverage, density of coverage, regular structure of coverage, cost optimization. 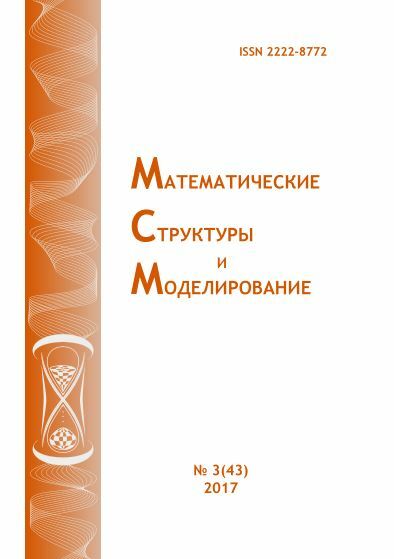 The article investigates the equilibrium dynamics in the sense of Nash of soils in arid and humid regions in the framework of the differential games theory. Keywords: The Nash equilibrium, model of soil, soil fertility, arid region, differential games.
. To increase the accuracy of computations by the method of collocations and least squares (CLS) it is proposed to increase the number of degrees of freedom with the aid of the following two techniques: an increase in the number of basis vectors and the integration of the linearized partial differential equations (PDEs) over the subcells of each cell of a spatial computational grid. It is shown that the proposed new versions of the CLS method possess a higher accuracy than the previous versions of this method. Furthermore, the version of the CLS method, which employs the integral form of collocation equations, needs a lesser number of iterations for its convergence than the “differential” CLS method. Keywords: method of collocations and least squares, preconditioning, Krylov subspaces, multigrid, collocation of integral relations, Navier–Stokes equations. This work considers comparison of two images (original and target) that are represented by black and white pixels to each correspondingly. The problem can be solved by detecting diffeomorphism that would allow to match deformed and template images. Solution to the problem is based on the method of constructing a minimized functional, which characterizes evolution process of the diffeomorphic transformation of the image from initial to the final one and “penalty charge” for the deviation of the image path from the required trajectory. An algorithm for solving the diffeomorphic transformation equation is developed on the basis of the gradient descent method. The considered problem of comparing two images can be used for constructing optimal metamorphosis of images, when there is no exact correspondence between the target image and the final image of the diffeomorphism. The designed algorithms can be used through a biometrical system, in images and subjects classification systems, machine vision systems, images and patterns recognition, tracking systems. Keywords: pattern recognition, Euler-Poincare equation, diffeomorphism, metamorphosis approach. In the book ”Mythical man-month, or How software systems are created,” Brooks refers to several studies on the basis of which it can be concluded that the productivity of the work of programmers, measured in the number of lines of code per time, decreases as the size of the program project grows. In this paper, we describe the formalization of the software development process, as the process of editing the source code of the program, with the help of which the laboriousness function is defined, and a sufficient condition for the constant productivity of the programmers, independent of the size of the project, is derived. Keywords: formalization, development process, software, productivity, Brooks, Mythical man-month. The article discusses the construction of software to develop recommendations for the appointment of UDC. The development is based on the k-means method. Keywords: method of k-means, lemmatization, TF-IDF. The article discusses the methods of information hiding in the MPEG-4 video stream using the H.264 codec. To test the possibility of embedding of information in the video stream, there was chosen method of embedding in the coefficients of the discrete cosine transform. The ability of embedding and retrieving of information was tested on modified OpenH264 codec. Keywords: codec, MPEG-4, H.264, embedding data, video stream, information hiding. We present a computer program that simulates the work of computer network and allows us to demonstrate the result of malicious attacks on network using several existing network vulnerability. Keywords: computer network, network attacks, attack simulation, computer program. In this paper, the task is to develop software that allows you to automate the search for groups and users in social networks that host suicidal materials and materials that violate copyright in the network. As a social network for exploring the possibility of such a search, the social network “VKontakte” — the largest social network of the CIS was chosen. The latent semantic analysis algorithm was based on the developed software. The main variants of the algorithm and the most adequately working on real data version is selected. Keywords: classification of texts, latent-semantic analysis, copyright, offenses, social networks, suicidal groups.